calibre has a powerful, flexible and easy-to-use framework for downloading news from the Internet and converting it into an e-book. The following will show you, by means of examples, how to get news from various websites. I got the RSS URL by looking under “Subscribe to” at the bottom of the blog page and choosing Posts → Atom. To make calibre download the feeds and convert them into an e-book, you should right click the Fetch news button and then the Add a custom news source menu item and then the New Recipe button. A dialog similar to that shown below should open up. First enter calibre Blog into the Recipe title field. This will be the title of the e-book that will be created from the articles in the above feeds. Sonraki iki alan (En eski makale ve :guilabel:`Azami makale sayısı `) her beslemeden kaç makale indirileceği konusunu kontrol etmenize izin verir, zaten ne oldukları epey açık. Beslemeleri reçeteye eklemek için, besleme başlığı ve besleme URL’sini girin ve Besleme ekle düğmesine tıklayın. Besleme eklendikten sonra basitçe Kaydet düğmesine tıklayın, hepsi bu kadar. İletişim penceresini kapatın. 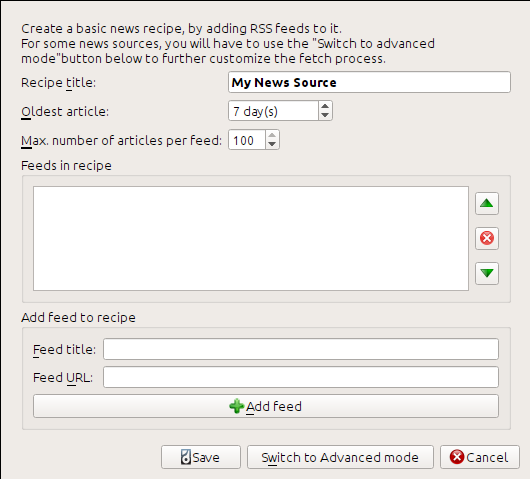 To test your new recipe, click the Fetch news button and in the Custom news sources sub-menu click calibre Blog. After a couple of minutes, the newly downloaded e-book of blog posts will appear in the main library view (if you have your reader connected, it will be put onto the reader instead of into the library). Select it and hit the View button to read! The reason this worked so well, with so little effort is that the blog provides full-content RSS feeds, i.e., the article content is embedded in the feed itself. For most news sources that provide news in this fashion, with full-content feeds, you don’t need any more effort to convert them to e-books. Now we will look at a news source that does not provide full content feeds. In such feeds, the full article is a webpage and the feed only contains a link to the webpage with a short summary of the article. Follow the procedure outlined in Calibre blog above to create a recipe for The BBC (using the feeds above). Looking at the downloaded e-book, we see that calibre has done a creditable job of extracting only the content you care about from each article’s webpage. However, the extraction process is not perfect. Sometimes it leaves in undesirable content like menus and navigation aids or it removes content that should have been left alone, like article headings. In order, to have perfect content extraction, we will need to customize the fetch process, as described in the next section. İndirme işlemini mükemmelleştirmeye, ya da karmaşık bir siteden içerik indirmeye çalışırken reçete yazılım çatısının tüm güç ve esnekliğini kullanabilirsiniz. Bunun için Özel haber kaynağı ekle iletişim penceresinde Gelişmiş Kipe geç düğmesine tıklamanız yeterli. The easiest and often most productive customization is to use the print version of the online articles. The print version typically has much less cruft and translates much more smoothly to an e-book. Let’s try to use the print version of the articles from The BBC. In the above, def print_version(self, url) defines a method that is called by calibre for every article. url is the URL of the original article. What print_version does is take that url and replace it with the new URL that points to the print version of the article. To learn about Python see the tutorial. Now, click the Add/update recipe button and your changes will be saved. Re-download the e-book. You should have a much improved e-book. One of the problems with the new version is that the fonts on the print version webpage are too small. This is automatically fixed when converting to an e-book, but even after the fixing process, the font size of the menus and navigation bar to become too large relative to the article text. To fix this, we will do some more customization, in the next section. Yeni sürüm oldukça iyi görünüyor. Mükemmelliyetçiyseniz, sonraki kısmı da okumak isteyeceksiniz, bu bölüm asıl indirilen içeriğin değiştirilmesiyle ilgilenir. Bu reçete calibre’nin gücüyle ilgili buz dağının yalnızca görünen kısmını keşfediyor. Calibre’nin yeteneklerinin daha fazlasını keşfetmek için sonraki kısımda daha karmaşık bir gerçek dünyadan örneğe göz atacağız. This sets the displayed time on the front page of the created e-book to be in the format, Day, Day_Number Month, Year. See timefmt. Bunlar ilk <h1> etiketinden önceki herşeyi ve footer id’li ilk etiketten sonraki herşeyi kaldırır. Ayrıca bakınız remove_tags, remove_tags_before, remove_tags_after. needs_subscription = True tells calibre that this recipe needs a username and password in order to access the content. This causes, calibre to ask for a username and password whenever you try to use this recipe. The code in calibre.web.feeds.news.BasicNewsRecipe.get_browser() actually does the login into the NYT website. Once logged in, calibre will use the same, logged in, browser instance to fetch all content. See mechanize to understand the code in get_browser. Son yeni özellik calibre.web.feeds.news.BasicNewsRecipe.preprocess_html() metodudur. İndirilen her HTML sayfasında keyfi dönüştürmeler yapmak için kullanılabilir. Burada nytimes’ın her makaleden önce gösterdiği reklamları geçmek için kullanılıyor. :komut:`ekitap-dönüştür` komutu tüm web sayfalarını indirir ve onları :dosya:`benimtarifim.epub` dosyasına kaydeder -vv seçeneği, ekitap-dönüştürün yaptığı işle ilgili birçok bilgi çıkarmasını sağlar. :seçenek:`ekitap-dönüştür-tarif-girdi --test` seçeneği en fazla iki beslemeden sadece birkaç makale indirmesini sağlar. İlaveten, ekitap-dönüştür indirilmiş olan HTML’yi, ayıkla :seçenek:`ekitap-dönüştür --ayıkla-ardışık düzen` seçeneği ile belirttiğiniz dizin olan, ayıkla/girdi dizinine koyar. If you’re satisfied with your recipe, and you feel there is enough demand to justify its inclusion into the set of built-in recipes, post your recipe in the calibre recipes forum to share it with other calibre users. On macOS, the command line tools are inside the calibre bundle, for example, if you installed calibre in /Applications the command line tools are in /Applications/calibre.app/Contents/console.app/Contents/MacOS/. The command line interface for all e-book conversion. BasicNewsRecipe sınıfı ve tüm önemli metod ve alanlarının belgeleri. Bir çok bilgili calibre reçete geliştiricisi orada takılır.